Located in the center of town, ferries and cruise liners can berth just meters from the commercial area and passengers can access the leisure areas on foot. Whilst moving into the port entrance, there are views of one of the most beautiful bays in the world. Today Santander is a popular tourist destination. It is renowned for its mild, (though rainy) climate. The cathedral: greatly damaged in the 1941 fire, this restored, fortress like 13th-century cathedral holds the tomb of historian/writer Marcelino Menéndez y Pelayo (1856-1912), Santander's most illustrious man of letters. 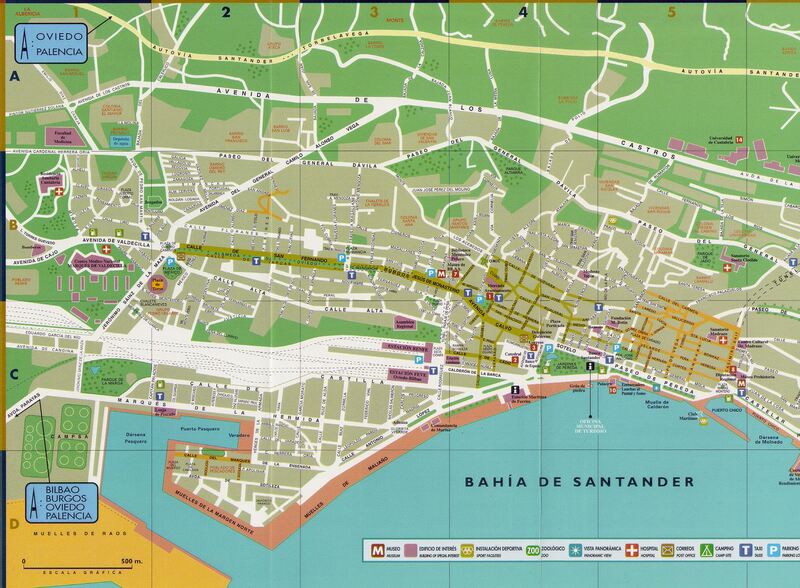 It is best to explore the fascinating city of Santander by foot. Next to the Sardinero beach is a European style casino. The Sardinero beaches are nice urban beaches, certain parts of which are popular among local surfers. The Plaza de Cañadío is a very popular place to start a night of drinking. The Plaza immediately borders seven different bars, and many other taverns are close by. There are many interesting shops at the Cuatro Caminos and the area bordering the Ayuntamiento. The Bay of Biscay, where Santander is situated, is undoubtedly one of the city's most recognizable icons. Its calm water changes color depending on the wind, creating a kind of magical element. The bay takes visitors to the Barrio Pesquero a fisherman's area lined with gritty taverns and earthy restaurants. Farther along is a street called the Paseo de Pereda, locale of Pereda Gardens, known as the "lungs of the city." Reina Victoria - Santander's main avenue and among the most beautiful maritime avenues in Spain, takes visitors to the Magdalena Peninsula, home to the English-style Magdalena Royal Palace. For the more adventurous, the best way to get an orientation of the city is to board one of the bay's sightseeing motorboats and take a trip to the lighthouse of Cabo Mayor, located on high, steep cliffs. The bay also hosts The International Festival Hall of Santander, a modern, box-like building that has the capacity to drop a wall and open itself to the bay for performances held under the stars. Centro Botin opened in 2017 almost next to the cruise dock. The west block is dedicated to art, with two exhibition rooms measuring a total of 2,500 m2; and the east block is for cultural and educational activities, boasting an auditorium for 300 people, classrooms, work spaces, and a rooftop terrace to enjoy the breathtaking views of Santander and its Bay. Hop on/off tours are at the cruise terminal. Most visitors to Santander head for El Sardinero, a resort less than 2.5km (1 1/2 miles) from the city. Buses and trolleys make the short run between the city center and El Sardinero both day and night. Santander has three beaches, Playa de Castaneda, Playa del Sardinero, and Playa de la Concha, where people stretch out beneath candy-striped umbrellas. If these beaches become too crowded, take a 15-minute boat ride to El Puntal, a beautiful beach that is rarely crowded, even in August. If you don't like crowds or beaches, go up to the lighthouse, a little more than 2km (1 1/4 miles) from El Sardinero, where the views are wide-ranging. A restaurant serves snacks both indoors and outdoors. Here, you can hike along the green cliffs or loll in the grass. Excursions run from here to Bilbao and the spectacular Guggenheim Museum. Santillana del Mar, only half an hour from the city center, is the most outstanding example of Romanesque architecture in Cantabria, the abbey church dates from the mid 12th century. This medieval town comprises a series of historical monuments built between the 14th and 18th centuries, which may be seen on a leisurely stroll through its narrow cobbled streets. The city of Santander can divided into two distinct areas: the busy commercial center where you'll find the majority of shops, local market, historic buildings and tourist attractions and the beach resort of El Sardinero with the former royal palace and casino. • 1 January, New Year's Day. • 6 January, the Epiphany. • 1 May, Workers' Day. • 15 August, the Assumption. • 12 October, Feast of El Pilar. • 1 November, All Saints. • 6 December, Constitution Day. • 8 December, the Immaculate Conception. • 25 December, Christmas Day.